To make installation of your new USB LCD easier, we suggest that you do not plug the LCD in until the required USB drivers are installed. Plugging the LCD in first will cause Windows to ask for drivers that you do not yet have creating complications. 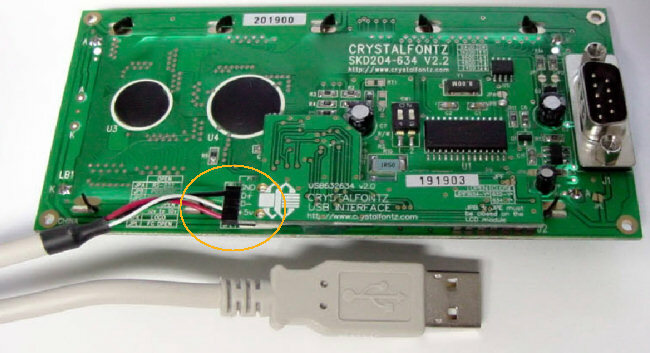 The drivers required to use a Crystalfontz USB LCD are located on the Crystalfontz website here. Once you have downloaded the USB drivers, install them to your directory of choice (the default directory is fine in most cases). Connecting your LCD to the computer is quite simple, only a USB cable supplied by Crystalfontz is required. First, connect the USB cable to the back of the LCD module. 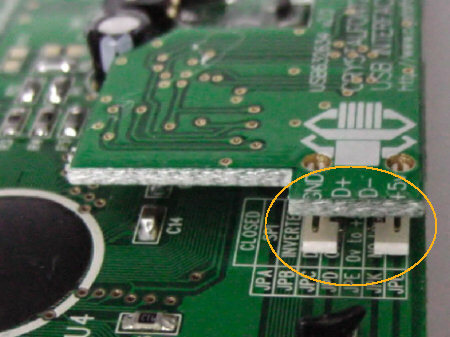 Be careful when handling the USB cable as the small connectors on the LCD can break if the cable is pulled away from the LCD while connected. Now simply plug the other end of the USB cable into an available USB port on the computer. Note: if a USB hub is to be used, make sure it is of the "powered" type, otherwise the LCD may not work. 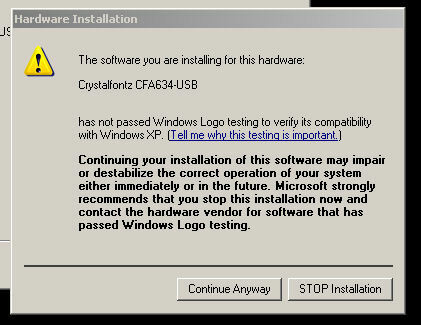 Once the LCD has been plugged in and the computer is turned on (if it wasn't already), Windows will detect the new LCD hardware which is indicated by a notice box popping up from the Start-Bar. In this window select "Install from a list or specific location" and click in the "Next" button. Un-tick the "search removable media" box, and tick the "include this location in the search" box. 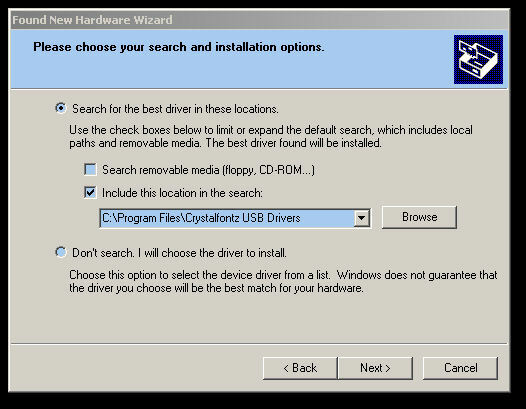 Then click the "Browse" button and select the directory that you installed the drivers to in Step-1 (normally "c:\program files\crystalfontz usb drivers") and click "Ok". Click the "Continue Anyway" button to continue installation. 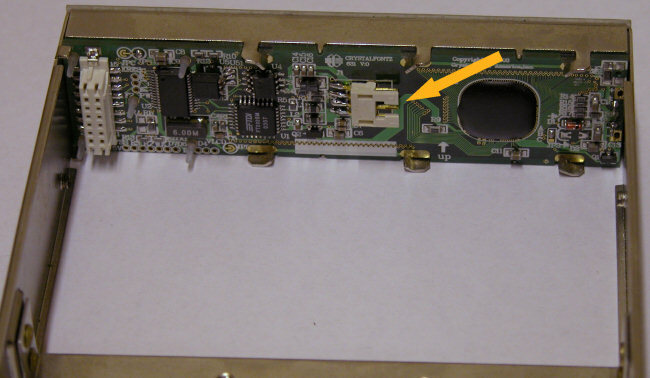 After this, Windows will locate another new piece of hardware, the "USB Serial Port" device. Go through exactly the same process again, specifying once again the location of the USB drivers. 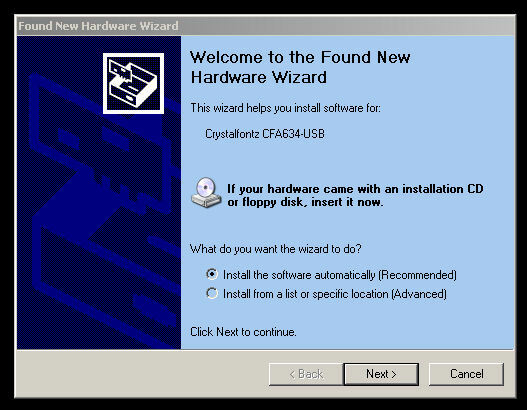 When the driver installation process in Step 3 is complete, your LCD should now be lit up and displaying the Crystalfontz greeting screen, or an empty screen with a flashing cursor. 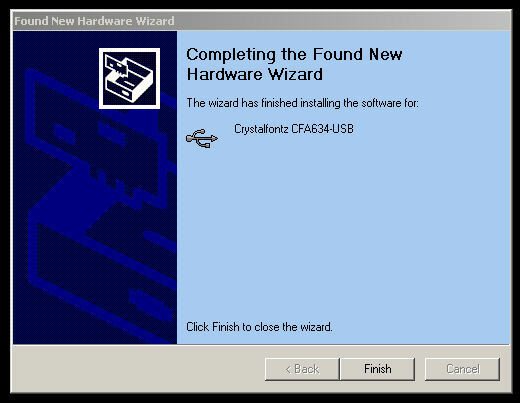 Now you are ready to install and setup CrystalControl2! If you have problems at any stage of the connection or installation of the drivers, please ask for further help on the Crystalfontz internet forums, or send an email for support.